Latex-Ite is one of the best driveway sealers on the market. It can be used to seal your driveway, runway, walkway, and even pavers. The products are designed in a way that makes repairing your driveway to be easy and fast. How good is Latexite sealer compared to others? Read this Latex-Ite Driveway Sealer review to know more about it. Since 1945, Latex-Ite, under Dalton Enterprises, has been coming up with innovative and high-quality seal coating products. Their products will not only beautify your pavement or driveway, but they will also protect it from harsh elements for durability. If you have different surfaces that you need to apply your sealer to, use this airport grade driveway re-surfacer. The sealer is made up of a skid-resistant formula, which is ideal for use even in wet conditions. The black finish will improve the aesthetics of your home and your driveway will be secured from harsh conditions like dirt, grease, and UV-rays. To fully utilize this sealer, you will have to stir it for around 15-30 minutes and apply it with temperatures of 55˚ or above. After one hour of application, you can start using the driveway as it dries up very quickly. For vehicle use, you will have to wait for 24 hours. This is one of the most popular pavement sealers offered by the Latex-Ite brand. It is a tinted driveway filler and sealer that can change and beautify your home. It is made up of a non-skid formula, which is very easy to stir. The 5-gallon sealer is not difficult to apply as it can be done within a few hours. Prior to starting, you need to get all your sealer ready and mix it as needed. Additionally, ensure that you mix the number of buckets that you will need to finish repair to prevent color inconsistency. After you have applied the first coat, let it stay for at least 24 hours and apply the second coat. Always ensure to have the ideal temperatures before starting to seal. Unless you don’t want the sealer to bond well and spoil after a few days or months of application. You should not use it on concrete as it doesn’t adhere well to this material. As seen from above, the Latex-Ite is a wonderful brand with a wide range of products. The brand may have great driveway sealers, but they also have their own setbacks. Therefore, the final decision lies in your hands on which driveway sealer to choose. Follow their instructions while sealing your driveway to ensure that it bonds well and adheres to the driveway or pavement. 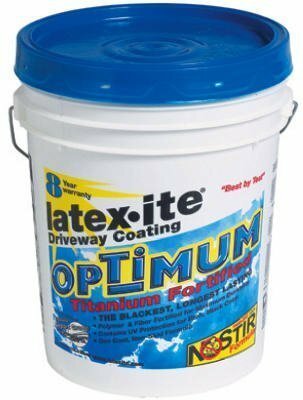 Hope you have found this Latex-Ite driveway sealer review to be helpful. The Latex ite driveway sealer drying time is 24-48 hours. If the weather is humid, then it may take a little bit more time. But, according to my experience it doesn’t take more than 24 hours to dry. Q. Will washing the vehicle before applying the sealer affect my driveway? Ans. You should cease washing your car on your driveway a few days prior to sealing it. This is because some cleaners contain silicone which prevents proper bonding of the sealer on the driveway. Also, you should not use tire cleaners on the driveway as they contain substances that will prevent the sealer from adhering to the pavement or driveway. Q. What brings about white steaks during sealing? Ans. There might a problem with the surface that you’re sealing. The limestone from the surface may be coming up with water through pre-existing cracks in the driveway. And if that’s not the case, then you should get in touch with the manufacturer of the sealer to know if the product has an issue or not. Q. Can I apply the sealer in areas with oil stains? Ans. The sealer will not adhere in such areas as the oil will prevent proper bonding to take place. Instead, you should clean the place and treat it with an oil spot primer. After applying the primer, you can now go ahead and seal the place.